We've had ample opportunity to ogle the electrical version of Fiat's venerable 500 when the Italian firm fortold its US arrival years ago. This week at the LA Auto Show, the car finally made its official debut, so naturally, we had to swing by and check it out. While we've got plenty of eye-candy of the diminutive EV in our gallery below, allow us to first regale you with the car's specs. Under the hood lies a 111HP motor powered by a 24 kWh battery that generates 147 pound-feet of torque -- not exactly the stump-pulling grunt of its new Yankee competition, but still plenty of power for such a small car. Range tops out around 80 miles in general use, while city drivers can expect an extra 20 miles per charge. Speaking of, the car gets all the juice it needs through a 240-volt outlet in just under four hours. Can't wait to get one? 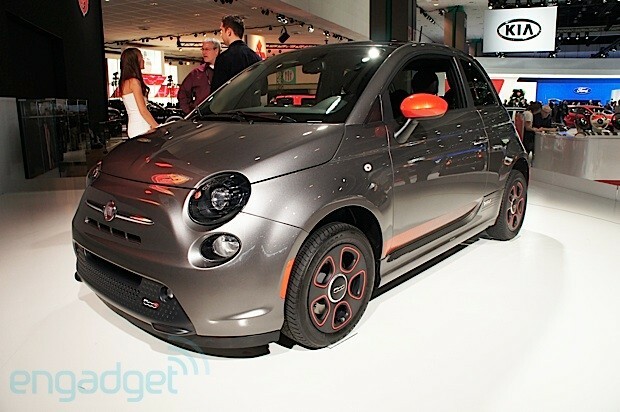 Well, Fiat's not telling how much the 500e will cost, but we do know it'll be available California starting Q2 of 2013, and it'll come to the rest of North America by the middle of the year.